in 360i News, Creative & Tech with tags Adaptoys, AXIOS NYC, Christopher & Dana Reeve Foundation, Donna Lowich, Eric LeGrand, Paralysis, Play Both comments and trackbacks are closed. We’re proud to announce today the launch of Adaptoys – adapted versions of popular toys that allow people with physical limitations to experience the joy of actively playing with their families. 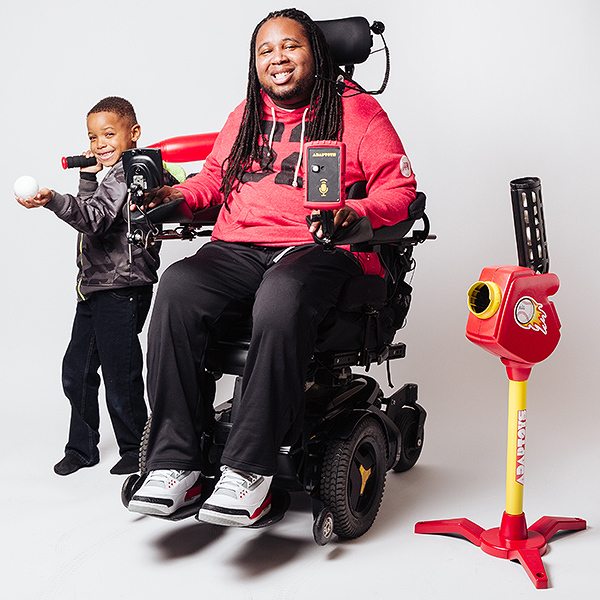 In partnership with the Christopher & Dana Reeve Foundation, we’re bringing the power of play to the 5.6 million Americans living with paralysis by equipping toys with voice activation, motion sensors and sip-and-puff (SNP) assistive technology. (Film created by production company Tiny Giant & director Charlie Mysak, with support from Jim Rubino of Fluid Editorial. )Partnering with technology company AXIOS NYC, we developed two initial prototypes, including a remote-controlled car operated by a responsive headset and a voice-activated pitching machine. With simple head tilts, an ordinary remote controlled car can be steered left and right, and accelerated by inhaling and exhaling into a straw. And with simple voice commands, a voice-controlled pitch machine reacts to pitch a ball. The toys were shared with Eric LeGrand, former Rutgers football player, and Donna Lowich, a grandmother of three young children. Both spent hours with their families actively participating in the activities in which they were normally relegated to experience as spectators. “It was amazing to feel that adrenaline again… it just gives me a little piece of independence,” expressed LeGrand. While technology has played a huge role in improving the lives of those living with paralysis – there are adapted automobiles, staircases, and communication devices today – one very important area of life had been largely overlooked, and that was play. To help revolutionize playtime for even more families, we have begun a crowdfunding campaign to raise funds to produce at least 100 more remote control cars and give them to eligible families for free. Learn more about how you can support the cause at Adaptoys.org.